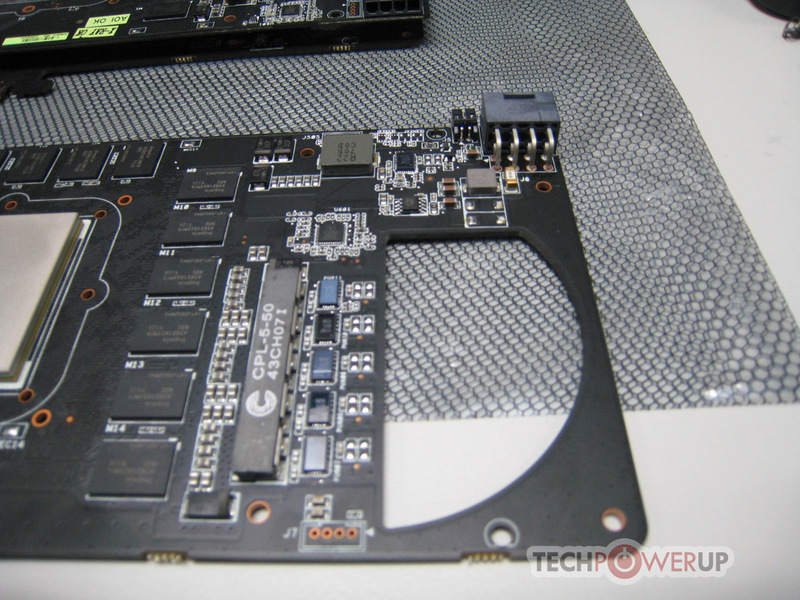 Each PCB holds 16 memory chips, a 6-phase digital PWM power circuit, drawing auxiliary power from an 8-pin PCI-E power connector, the GeForce GTX 285-class GPU, and its companion NVIO2 processor. The PCB holding the PCI-Express bus interface, also holds the bridge chip. 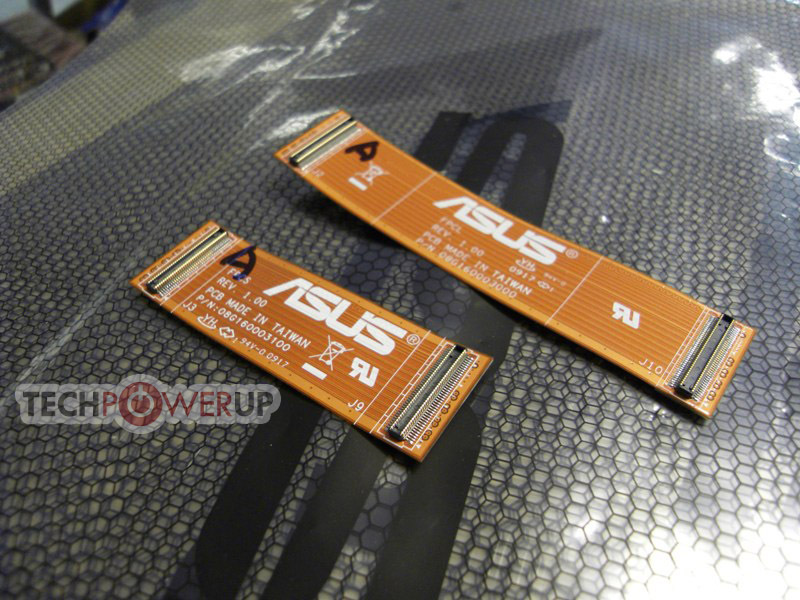 ASUS broke away with using the nForce 200 chip, and instead is using a yet to be disclosed third-party bridge chip. Currently, PLX and IDT are two likely sources for such a chip. The memory consists of high-density 0.77 ns memory chips made by Hynix. The electrical-management on each PCB is care of a Volterra VRM controller, which supports the I2C interface, which means that the card supports software voltage control, perhaps a big plus for ASUS' Voltage Tweak feature that is gaining in popularity. Fused power circuit provides Over Current Protection while also facilitating extreme overclocking. The cooler internally has the same basic construction as the reference cooler, it uses a single leaf-blower. The card spans across two expansion slots and is slightly higher than the reference design card. ASUS also used slightly longer internal bridges that make more room for third-party coolers, and the likes. 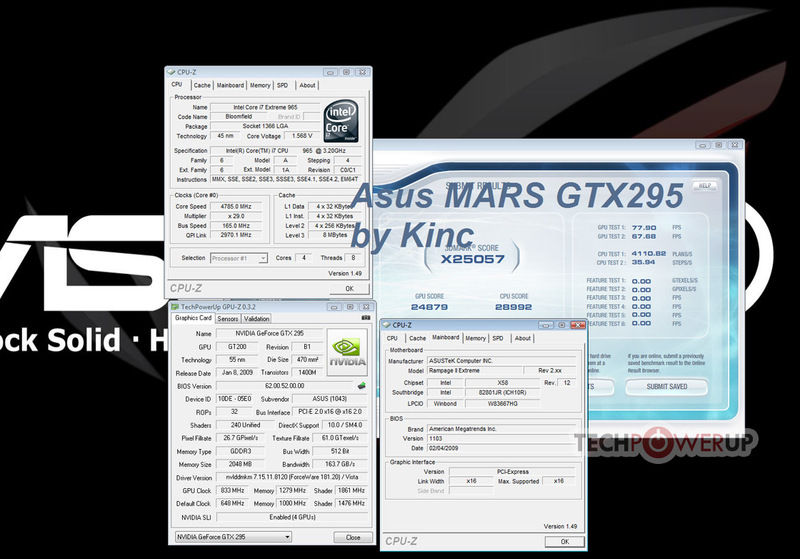 Our source from ASUS EMEA conducted a quick 3DMark Vantage test proving the card's seamless compatibility with existing drivers, while also providing a significant boost in performance over existing GTX 295 cards. Being Quad-SLI capable, this card finally makes GeForce GTX 285 (effective) quad-SLI possible, and makes for the most powerful desktop multi-GPU setup ever conceived. 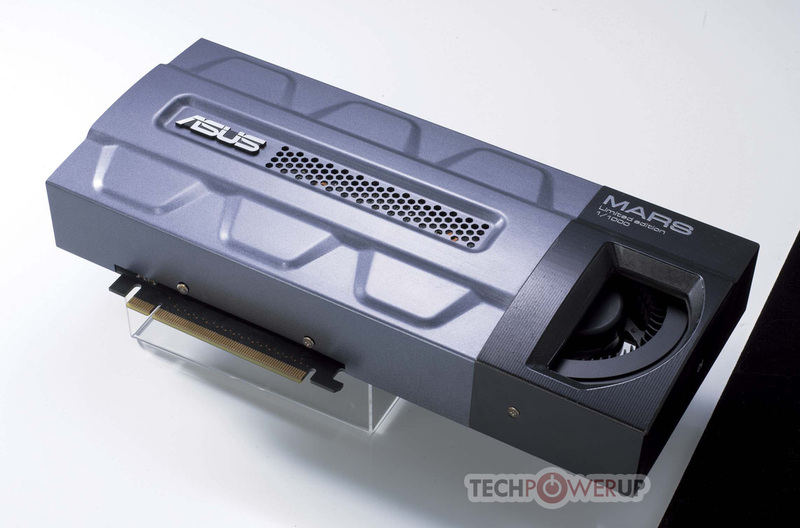 ASUS designed this card despite pressure from NVIDIA enforcing its rigid policy of restricting its partners from custom-designing GeForce GTX 295. If everything goes smooth throughout the development process, the card might make it for a gala launch at Computex. Is it just me or did this seem to happen "over night"? No prior warning, nothing?! Bout time we saw something unique. Go Asus! nVidia, know your place! Get back to the fab and cook me more GPUs! will the extra... 2-ish GB ram actually give any performance increase? ASUS has created a god among video cards. Imagine the trouble 32bit users would have running this. how come you say that? Crank up the texture quality in GTA4, and watch that GTX 285 1GB cry. oh.. amount of memory directly relates to texture quality? 32bit OS's use a max of 3.2GB (I think?) of ram, and that includes GPU ram, so if you have 2GB of ram and then a 4GB card in, it may cause conflicts. Anyone feel free to correct me if Im wrong. 32-bit OS = 4GB max of memory address space. If you had, say, 2GB of ram, then there's only 2 left for addressing, which means that your shiny gpu can use a max of 2GB of ram. If you had 4GB of ram, then to fit all that vram in, it takes away from system ram, leaving you with way less than 3GB most people get from a 32-bit OS with 4GB of ram. Typed in a hurry, does it make sense though? I want to know where this came from, TPU rarely is the one breaking the news. TPU rarely is the one breaking the news. Yeah, your card is awesome. Especially when an app is asking for 1.5 GB of video memory. I dont think that was the point of his post? I don't think you got the point of my post either. App requiring 1.5 GB of video memory, on a card with 896 MB = at least 100% more read-backs, can't play the game beyond a point. Hence he said "for a while". You dont have to be so arrogant bta. I wasnt being. All my point was that my GTX 260 didnt scream, and just because the game settings say thats how much its using doesnt mean thats what it uses. Also drivers assign around 2Gb of shared system memory as an overflow to the on board memory. When I said a while it went for about an hour before crashing and that was with tons of vehicles and explosions, no popp-ins, crazy textures nothing. I wasn't being either. Maybe I should decorate my posts with more smilies now on. In games NO ! 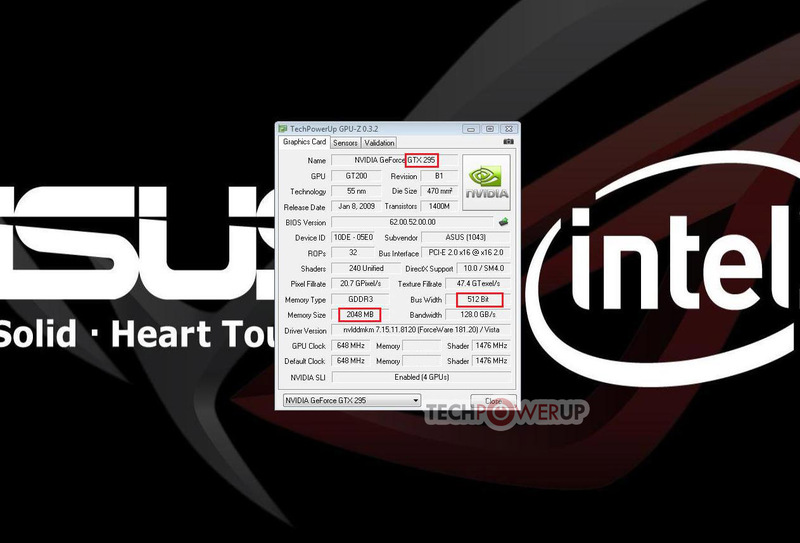 since it`s GDDR3 , the performance might actually drop in some games .Take HD4870 for example . The card uses GDDR5 , and you barely see any difference between the 512 and 1024 version , just in really high resolutions when you run out of buffer . But again , no big difference .